Sand Hills, FL—The 5th annual C.H.A.M.P. Camp ended Saturday over at Deane Bozeman School. The camp’s namesake, though, holds a deeper meaning. C.H.A.M.P. stands for character, heart, attitude, motivation, pride. Yes, the kids work on the X’s and O’s of football, but camp founder, Gracville native, and Assistant Director of Pro Personnel for the Denver Bronocos Anthony “Champ” Kelly hopes to help his campers improve in those five key areas for growth off the field. That’s why he provides the kids from 10 years old to 18 the best he can, bringing in NFL players who can tell and show the young guys how to be great like Steve McLendon of the Steelers and Rutherford alum and 12 year vet Will Witherspoon. That’s why Champ brings in guests like FOX Sports 1 NFL Insider Mike Garafolo, so the campers can learn about keeping a strong persona in the media, and especially social media, getting a head start on brand building. That’s all because Kelly only knows how to give a champion’s effort into running C.H.A.M.P. Camp. One reason Kelly brought in Garafolo is to introduce the campers into the mindset of the media. After covering the New York Giants beat for The Star-Ledger of Newark in New Jersey and reporting for USA Today, Mike has brought his knowledge of the NFL to FOX Sports on the web and the air. 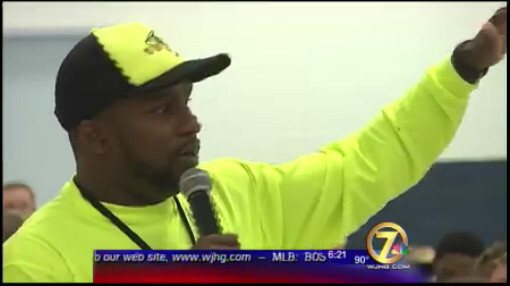 Knowing the ins and outs of covering pro football, he was able to tell the campers how to build a sound, strong reputation through the press and online.